What is Fearless Job Hunting? Success in job hunting isn’t about chasing job postings, sending resumes, and filling out endless online application forms. If any of it worked, you’d have the job you want. That's why Fearless Job Hunting is not a step-by-step "process" for landing a job. There is no such thing. The sad truth is, the "employment system" is broken. Your challenge is to step over that broken system to get the job you want. How you cope with these obstacles will make or break your job search, no matter how good your resume is, how clever your interview answers are, or how many jobs you’ve applied for. I’d like to give you an edge, and help you anticipate and overcome the intimidating roadblocks when you’re trying to land a job, so you can stand out as the most profitable hire. Every one of the Q&A lessons in the Fearless Job Hunting books is based on a real obstacle encountered by a real person in the real world, told in their own words. I’ve answered over 30,000 such questions. The best Q&As made it into the Ask The Headhunter Newsletter. And now I’ve selected the toughest questions and my very best advice, expanded my answers, and added much more -- to create Fearless Job Hunting. Millions of job applicants get rejected every day because winning a job isn’t as easy as posting your resume, filling out forms, and explaining where you see yourself in five years. The best way to stand out is to show an employer why you’re the profitable hire. You must be fearless about selecting and approaching the right employers, and about demonstrating your value. As Ray suggests, success means doing the work to get the edge you need -- while others wait for the system to process them. I’ve taught these obstacle-busting lessons to Executive MBA students at UCLA, Cornell, Harvard, Northwestern and other top schools, and to corporations, professional associations, career coaches, salespeople, IT professionals, college students and people in almost every line of work. This isn’t rocket science. Once you get it, it’s obvious. 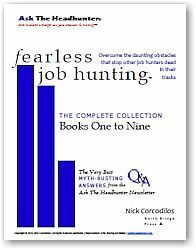 Each of the Fearless Job Hunting lessons shows you how to overcome daunting obstacles that stop other job hunters dead in their tracks. Get the edge -- and say hello to total control over your job search. Discover Fearless Job Hunting for yourself. Copyright © 2013 North Bridge Group, Inc. All rights reserved world-wide. Ask The Headhunter®, The insider's edge on job hunting and hiring™, Fearless Job Hunting™, the ATH logo and other ATH titles are trademarks of North Bridge Group, Inc. and Nick Corcodilos.